On the followup to the followup (and another million-selling #1 hit), Bonnie Raitt contributes more than her usual share of original songs, writing four songs herself and setting a lyric of her husband's to music for a fifth. Elsewhere, she draws on such strong writers as Richard Thompson and Paul Brady, all for a collection devoted to devotion. Song after song expresses passion, usually with happy results - this is not the album of a woman with the blues. Even when she's dressing down a parent in her own "Circle Dance," Raitt offers forgiveness and understanding. There, and in other songs, the object of her emotion rarely seems to be perfect, but she takes that in and loves him, anyway. Co-producer Don Was provides a detailed production in which single elements -- an accordion, a harmony vocal by Levon Helm or David Crosby -- effectively color arrangements and complement Raitt's always soulful singing. 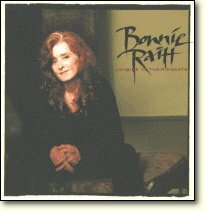 Levon's harmony contribution to this Bonnie Raitt album is on the title track "Longing in Their Hearts".